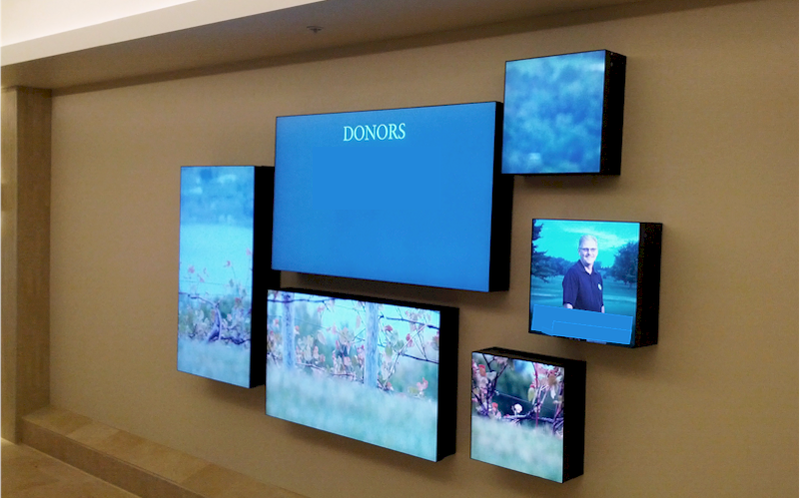 Repeat Signage Media Wall software displaying artwork, pictures of donors and Microsoft Word document of donor names. Please note we have blanked out the donor names for privacy and security. Repeat Software worked with a US based digital artwork installation company to set up a ‘donor wall’ in a large US hospital. 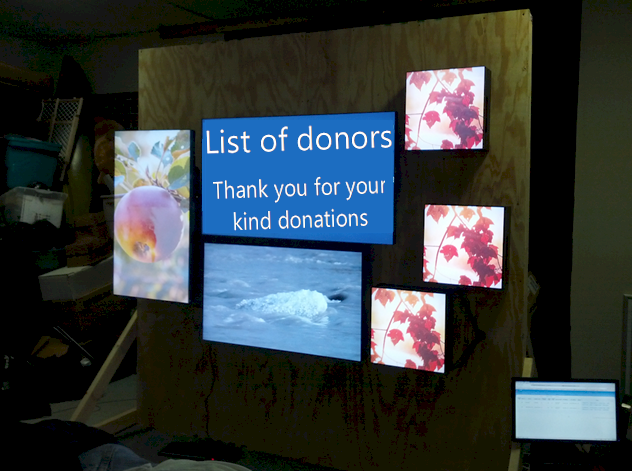 This was a 6 screen installation to display thank you messages to people and organisations that had donated money to the hospital. 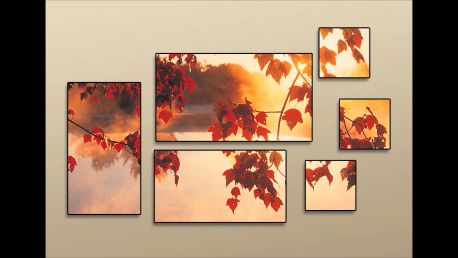 The plan was to create a work of art that displayed beautiful background images that spanned all 6 screens and then to change some or all of the screens simultaneously every 15 seconds. 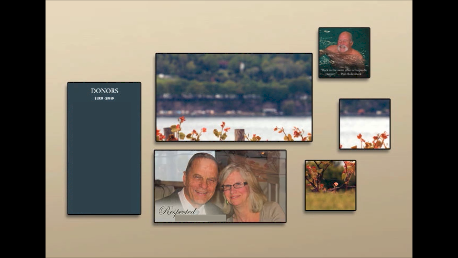 Along with the background images, Microsoft Word documents with the names of people who had donated, and also images of patients, donors and doctors, needed to be displayed on individual screens. Since this project was completed, and is still successfully displaying the US hospital donor wall, Repeat Signage now has an in-built spreadsheet grid and page-turning PDF feature to give more flexibility on documents that can be displayed. 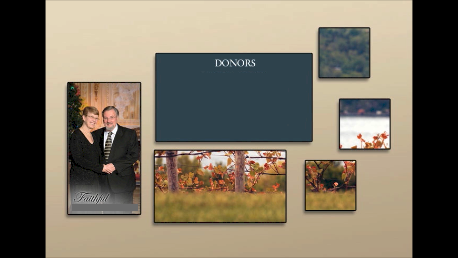 Donor Background 1: There were several background images that needed to span the screens. The client needed a very specific play list, including periods where some of the images changed every 5 seconds. The timeline diagram showed what needed to be displayed on each of the 6 monitors over a 24 minute period. 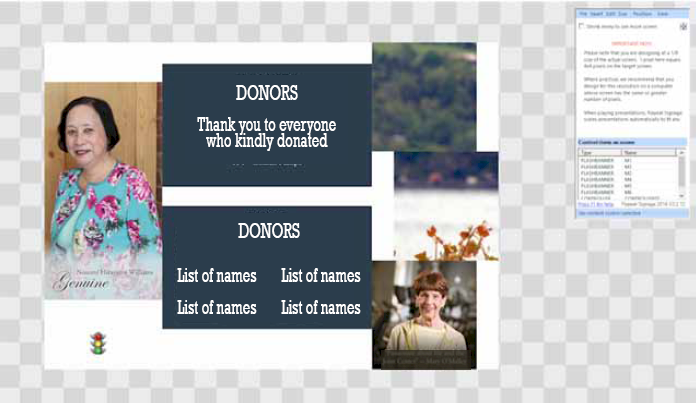 The Microsoft Word documents which contained the donor’s names needed to be updated by the hospital’s staff frequently and the donor wall being updated automatically from the Word documents on their network. Three of the six monitors were True HD, i.e. had 1920x1080 pixels, and three 960x960 pixel monitors. The left most monitor was mounted in portrait mode and the rest in landscape. The installation company used a single, top of line PC, with a 6 port graphics card, to connect the 6 monitors. One of the benefits to the installation company was the single PC with 1 Repeat Signage Media Wall software licence, rather than having to use 6 separate player PC’s that other digital signage systems used. The system and presentation was set up at their site before the final installation. On installation at the hospital, the PC had to be placed around 100 feet away from the screens, which required video signal senders to be used on each monitor cable. The installation company ended up installing a webcam pointing at the screen so they could see what was happening from the room that housed the PC. 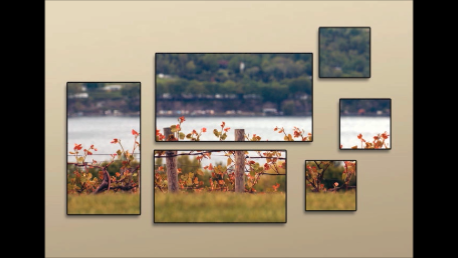 We started with Repeat Signage Media Wall edition, which is designed to create a small media/video walls, but at that time had only been tested with 4 screens. When testing this we found that updating several of these monitors at the same instant caused delays with our existing Pictures and Flash banner controls. So our Repeat Software team added a new high performance fader to our Flash banner control called ‘FADER 01’, which you will see if you insert a Flash banner control into a Repeat Signage presentation. We set up a presentation that was 4160x2880 pixels with 6 Flash banner ‘FADER 01’ controls sized and positioned to match the physical positions of the screens. Another technical issue was the display of Microsoft Word documents, containing the names of donors. These needed to be used with the Flash banner control, which only accepted pictures, so we updated the control to allow the display of Word documents as well. 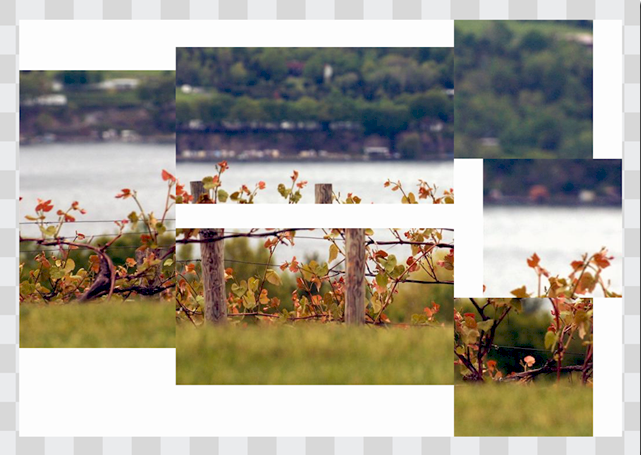 The final piece of the puzzle was that of the background images. The first background was a single background image. So we were left with two choices in order to put these bits of the background images in the play lists of each of the Flash banner controls. Either manually cut out each of the parts of the background image so that each of the controls had its own piece. 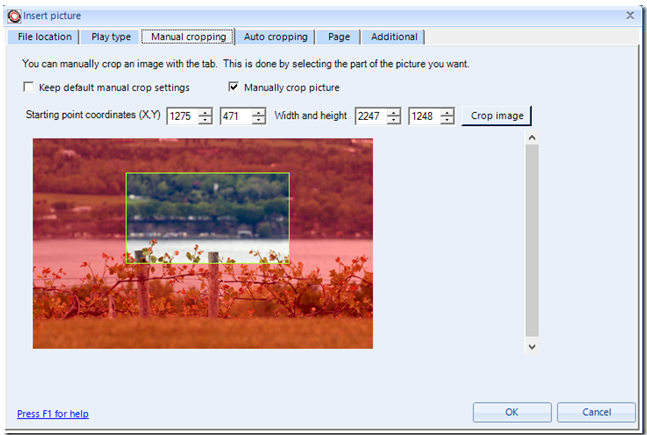 OR allow the manual cropping of images in Repeat Signage so that a default area for each control could be specified and the same background pictures could be used for each controls but different areas of the picture specified. 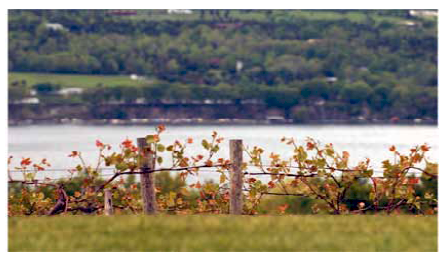 We decided to do the latter and altered Repeat Signage to add manual cropping for images. 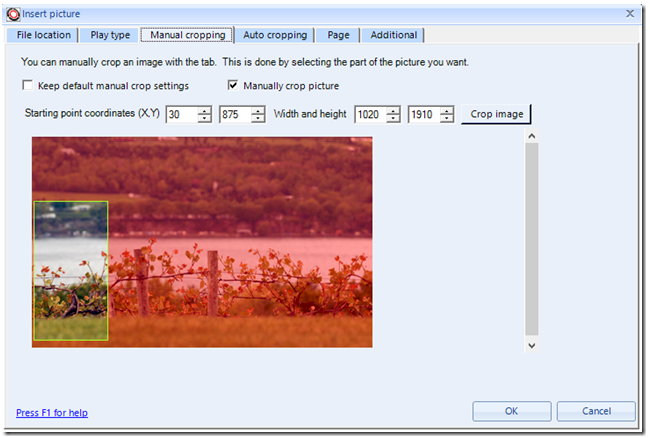 One picture was cropped in the area of the background needed for the central monitor and the other image shows the cropping area for the left screen. This system has been in place at the hospital, successfully running 24/7, since December 2013. One of the things clients like about Repeat Software in our company’s willingness to customise Repeat Signage to fit clients needs. Doing this particular project meant changing several parts of the system, including manually cropping of pictures, display of Microsoft Word documents in picture based controls and the introduction of the Controller. We are happy to discuss new features and implement those which will have a wider benefit to our existing and future clients. We also welcome working with system integrators and new Repeat Signage reseller partners. More information on Repeat Signage Media Wall software.